Fieldmarshal Kesselring's Tenth and Fourteenth Armies had been whipped on the southern approaches to Rome. To defend the city itself would have been anti-climactic. And so, when the Germans pulled out of the Italian capital, it was not only in the interests of the Pope and the survival of time-worn Roman monuments, but more for the establishment of a hurried defense line to the north. The Eternal City burst forth in a blaze of glory Sunday, June 5, 1944, just one day before another mighty army sailed against Normandy. Groggy infantrymen, uplifted by the cheers of the hysterical Roman mob, marched in from the Alban Hills, or rode tanks like ancient gladiators on chariots, past the Coliseum and the Forum and on down the Corso Umberto. 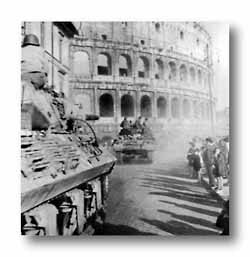 Weary infantrymen, riding tank destroyers, surge into the eternal city past the ancient coliseum. 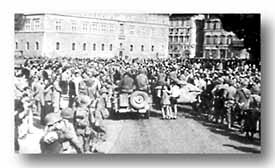 This photograph, taken from captured enemy film, shows the German garrison pulling out of Rome. 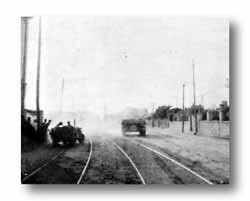 Afternoon of June 4, 36th Division men fought their way into the suburbs, Sherman tank, in center, has just fired. During the night Division troops mounted armor and trucks, formed in a column and moved boldly through the silent, moonlit streets through the heart of the city. At daybreak, the Tiber was crossed and the column headed out past the Vatican into the open country to the north. Germans were in waiting five miles beyond. While Rome cheered its liberation from dawn till dark of June 5th, 142nd infantrymen fought to reduce the strong German delaying effort outside Rome. Wide-eyed veterans poured through the prized objective all day. The enemy was on the run. 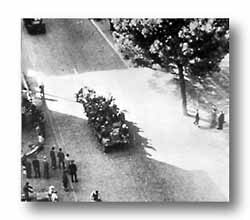 If Rome was still bound by Fascist ties on June 5, hurriedly those ties were tossed into the Tiber River. For on that day the Romans were a mob, exultant and passionate, humble and reverently thankful. 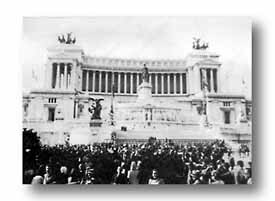 Crowd gathers in Piazza Venezia where stands Italy's ostentatious monument to King Victor Emmanuel. 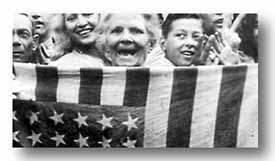 They laughed and cried, several generations of Italian citizenry register approval of the American entry. Bridge intact! 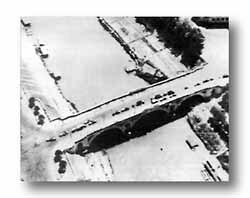 Long convoys of troop transports cross the Tiber River in pursuit of the fleeing Germans. Some of the troops marched into Rome, others rode jeeps, half-tracks and tanks. The crowd cheers.